There’s no doubt that swimming is one of the best forms of exercise for all round physical fitness. What it can also do is contribute to improving mental health including depression. And making the move to swim outdoors in open water can help even more. Here are six reasons why open water swimming can be an exercise for depression and help fight off those dark clouds. Just remember to get a physician’s advice if you’ve not done this before and make sure that you stay safe. Simply getting outside in the fresh air (and hopefully sunshine) is beneficial. Vitamin D has been shown to help with some forms of depression and being outdoors also wards off seasonal affective disorder (SAD) as your body gets the chance to absorb even the faintest of sun rays as well as feeling the benefits of breathing fresh air. Making the move to outdoor swimming in open water provides a fabulous opportunity to get outside and appreciate scenery from a brand-new perspective. If you’ve not tried it before, it’s a good idea to get some coaching or find guided sessions. While the idea of cold water may not be appealing, the therapeutic benefits of it should not be overlooked. Get into the water gradually, splashing the water on pulse spots at the wrists and back of your neck. Once you are chest deep in the water, consider your breathing. It’s at this point that you’re likely to take a gasp as your body experiences the drop in temperature. Make sure you’re breathing evenly before setting off. The cold water has a positive impact as you’ll create a burst of adrenaline and this can help to lift your mood. Keep moving and your amazing body will soon adapt to the cold. And, you’ll be surprised at how much you actually enjoy the sensation. Immersion in cold water is therapeutic and one of the theories regarding why this is the case is the distraction it causes. It’s difficult to think of anything else when your entire body is submerged in cool water. This too can help alleviate low moods associated with depression. The positive impact can last for several hours after your swim session ends. Depending on water temperature, a wetsuit may be needed. Go to a specialist to get fitted. It needn’t be that expensive but ensuring a good fit is essential for you to be comfortable and able to move easily. My biggest disappointment with wetsuits is that I expected it to act like all over spanx and hold in all my “curves”. Sadly it just spread over them like chocolate! Most forms of exercise have been shown to help with depression and other mental health issues. Once you’re used to the water, get swimming. You don’t need to go too far but make the session count. If you’re wearing a wetsuit, it will help your buoyancy and you may also find that you need to adapt your stroke and find you have more resistance around your shoulders. Think of this as an effective way to develop the tone in that area. As you may be more buoyant, you may feel that you don’t need to use your legs as much. However, it’s important to keep you legs moving as you want to maintain the circulation and keep yourself warm. Set yourself targets in terms of distance and make the most of the opportunity to improve your form in the water. If the water is a little choppy you’ll also need to lift your arms higher. Not having to turn regularly like you do in an indoor pool also leads to a more consistent swim. Relish the differences compared to swimming in a pool. This is something else you may need to adapt when swimming outdoors. You may need to lift your head higher out of the water or be restricted to breathing to one side because of waves in the water. It’s important to get into a rhythm quickly. Blow out under water, then breath in the sweet outdoor air when you come up. Focus on your breathing pattern – it’s the most important part of the process and can turn into a form of meditation as you concentrate and block out other thoughts. Swimming in a pool with friends is fine. 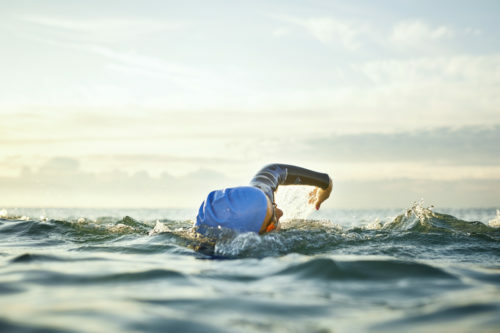 Swimming in open water, whether it’s a river, lake or the ocean, can be so much more fun. Sharing that outdoor experience and looking out for each other’s safety makes it a whole different event. And not everyone needs to swim. Having someone in a kayak as a safety measure can add to the fun. Challenge each other and relish your friends’ success too. “You never have any fun in your comfort zone” is a phrase you may have heard. Challenging yourself by taking your swimming into open water can be so beneficial to your self-esteem. Yes, it’s cold. Yes, there might be scary things in the water. Yes, the water may be deeper than you’re used to. Getting in may be a challenge so just go for it and amaze yourself. Whilst swimming in open water can help improve your mental health and symptoms of depression, it’s important to continue to follow your physician’s advice regarding all aspects of your treatment. The post Exercise for Depression: Swimming in Open Water appeared first on Prime Women | An Online Magazine. © 2019 PrimeWomen.com | PLATE Program. All Rights Reserved.